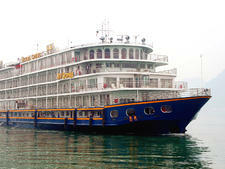 Unbeknownst to most Americans, cruising China's Yangtze River is a booming and popular vacation choice. 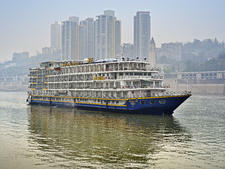 On the river between Chongqing and Yichang one sees seemingly hundreds of similarly shaped flat-bottomed, multi-decked, shallow draft river cruisers in passing. Of those ships, however, the vast majority are aimed solely at the domestic Chinese market. Of the handful that cater to Western passengers, Victoria Cruises is the only line that is U.S. owned and operated. Founded in 1994 by the Chinese-American Pi family, this New York-based company began operations by leasing vessels and crews from existing Chinese shipping operators and manning them with English-speaking cruise staff. Ultimately finding this arrangement to be a compromise and unsatisfactory for the product they envisaged, Victoria began a program, completed in early 2003, of returning the leased vessels to their owners and custom-building a fleet designed expressly for the preferences, tastes and priorities of a Western -- especially American -- clientele. Aboard these upscale ships the understated decor is warm, comfortable and luxurious, and the cuisine excellent. Many English-language travel operators, including those in the river cruise industry, have taken notice. Victoria's sailings are marketed and sold by Avalon Waterways, China Plus, Gate 1 Travel, General Tours, Globus, Orient Flexi-Pax, Pacific Delight Tours, Ritz Tours, Swain Tours, Trafalgar, Travcoa and Uniworld. Currently, Victoria operates solely on China's Yangtze River, and, like river cruises worldwide, these voyages are as much round-the-clock shore excursions and floating enrichment programs as posh cruises. 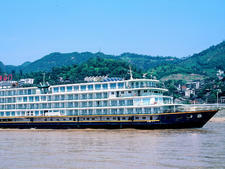 As the topography of the Yangtze changes back and forth from bustling river ports to terraced rice paddies to fjord-like precipitous gorges, the passing scenery on riverbanks, seemingly close enough to touch, is described by a bilingual (Chinese/English) river guide, and provides a moving backdrop during the extensive periods of daylight sailing. There are daily port calls as well, featuring unfortunately all-too-rushed shore excursions. At night, ships' entertainment leans toward the cultural, with, for example, performances by members of the Beijing Opera, or fashion shows with crew members modeling clothing stretching from thousands of years ago to the hip, contemporary youth-oriented fashions of modern booming Shanghai. Quality cuisine is given a high priority aboard Victoria's ships. Breakfast and lunch are served buffet-style, and include a mix of Western and Asian choices. Dinner is predominantly Chinese, served "banquet style" in a single seating with assigned tables. Though the ambiance is by and large casual, there are two dinners where jacket and tie (and equivalent wardrobe for the ladies) is recommended: a welcome aboard dinner and farewell dinner (often on succeeding nights on three-night cruises!). Victoria Cruises bends over backwards to please Western tastes. As a result, Americans account for 60 percent of the passenger load. Most of the remainder come from Europe and Australia. Currently, mainland Chinese amount to less than five percent. Most passengers are over 50, seasoned travelers with a sprinkling of younger passengers and families. Victoria's fleet currently consists of eight ships, of which the oldest, Victoria Rose, built in 1992 (rebuilt 2001) is the sole representative of the earlier, "classic" series. The Victoria Rose carries 130 passengers. The other seven vessels are considered "premeir ships" and carry between 198 and 416 passengers. 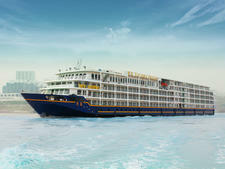 The newest ship, Victoria Jenna, was launched in summer 2009 as the largest river cruise ship ever built. The 308-passenger Victoria Anna debuted in 2006. Victoria Katarina launched in March of 2004. The remaining four premier ships -- Victoria Star, Prince, Queen and Empress -- built between 1994 and 1996, have all been refurbished between 2002 and 2004. Across the fleet, all accommodations include private balconies, satellite television and spacious bathrooms with tubs and showers. Yangtze's "River of Heaven" flows 3,964 miles from Tibet to the East China Sea near Shanghai. Of its entire length, the 1,649 navigable miles between Chongqing (FKA, Chungking) and Shanghai are plied by the ships of Victoria Cruises. This span is broken up into four itineraries: "Three Gorges Highlights" one-way between Chongqing and Yichang, (four nights upstream/three nights downstream); "Three Gorges Explorer" round trip Chongqing/Yichang/Chongqing (seven nights); "Grand Yangtze Discovery" one-way between Chongqing and Shanghai (eight nights upstream/seven nights downstream); and a special itinerary unique to Victoria Rose, is offered between Wuhan and Shanghai. 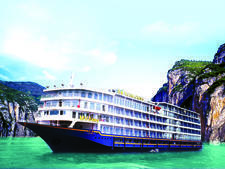 Though it is possible to book these cruises as a stand-alone product directly through a travel agent, for the vast majority of passengers, the cruise is offered as part of a longer land-based tour of China. The cruise fare, in these instances, is embedded in the overall tour price, and includes all shore excursions at no additional cost.